March 3-9th 2008— The crippling effects of the housing crisis have hit low-income and immigrant communities in Los Angeles hardest. Next week, groups from all over the Southland will gather together for a series of community dialogues addressing gentrification and its effects on our communities. These evening community ’charlas’ will take place in South LA, Boyle Heights, Echo Park, El Sereno, MacArthur Park, and Oxnard. Concerned LA community members came together to organize this tour and have invited a group from New York to facilitate the discussions. The NY group, Movement for Justice in El Barrio, was founded by immigrants and low-income people of color. For the past three years, this 400-member strong tenant rights organization has successfully staved off the gentrification of Spanish Harlem. 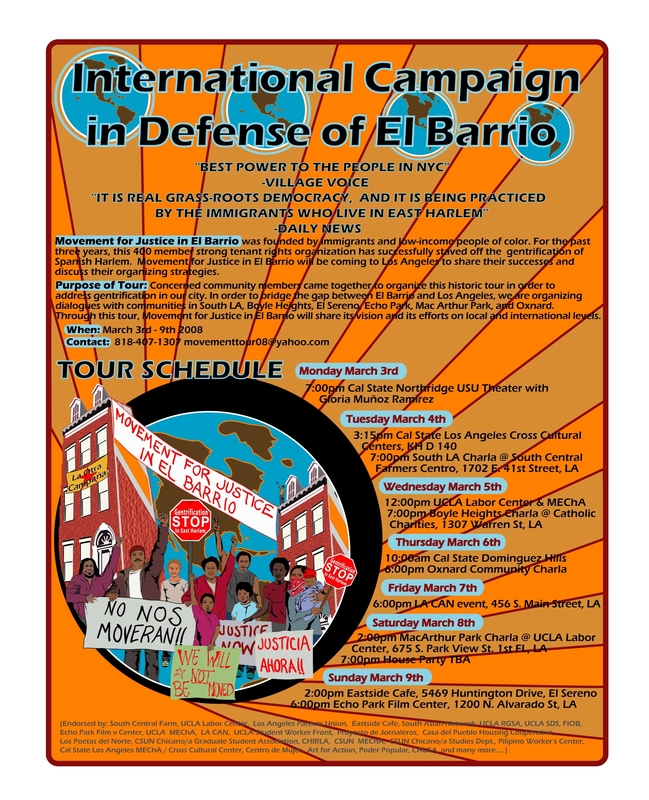 Called the “Best Power to the People Movement in New York City” by the Village Voice, and described as “grass-roots democracy…being practiced by the immigrants who live in East Harlem” by the Daily News, Movement for Justice in El Barrio will be coming to LA to share their successes and discuss their organizing strategies. Movement for Justice in El Barrio has been covered by news outlet such as Znet, La Jornada, the Indypendant, and El Diario, among others. They've shared their story at the US Social Forum, community dialogues, and university events across the country.